Pamela Freedman and I were delighted to be asked on behalf of S.G.S. to judge this years’ HND2 student glass prize at City of Glasgow College and arrived early to get a clear view of the work in order to make our selection before the place filled up, which it quickly did with students, staff, family members and other visitors. Due to the fact that the entire college is about to re-locate to a brand new building this summer the exhibition was a little smaller than usual and situated in the foyer of the building rather than the classrooms as normal but, alongside the beautifully displayed stained glass panels there was still a small range of 3-D work including cast pieces, pattern bar slabs, drop out vessels, combed pieces, pot melts and fused and slumped bowls and ornamental pieces. Some pieces of note were Maggie McKie’s pattern bar slabs which were psychedelic; a cast piece by Louise Armstrong which was a simple oval(ish) shape with a hole in the middle of it and a beautiful icy turquoise colour; Lorraine St Arnaud’s unusual fused and combed platter in a vibrant mix of blues, whites and oranges; and two beautifully cold worked cast pieces by K Gow. We perused the first years’ panels before the second years’ and I think it’s safe to say there are a few names to watch out for next year. Our job was the 2nd years though, whose work was very diverse, ranging from Rachel McGloan’s graphic depiction of Wonder Woman to Kirsteen O’Donnell’s painterly abstract panel and everything in-between. Maggie McKie had delicately painted a selection of beetles, butterflies and bugs and presented them in a grid format with a large butterfly in the middle. K Gow’s panel contained a representation of Glaswegian landmarks and was well painted and composed. Colin Goodall’s panel contained symbolic elements such as the sun, the yin and yang symbol and some tulips in an abstract design. Congratulations to all of the students. 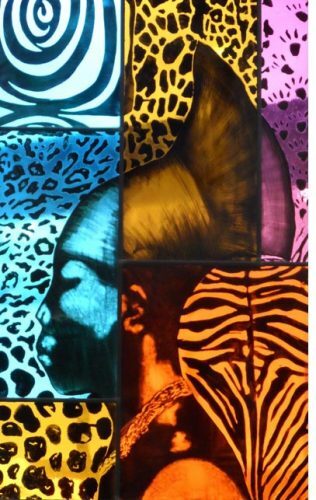 We unanimously agreed that the prize should go to Lorraine St Arnaud for her depiction of an African woman set against a background of animal print pattern. 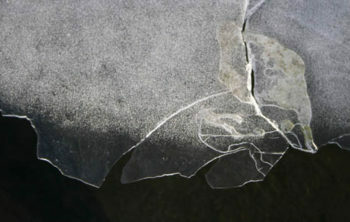 Her use of richly coloured glass was handled beautifully and worked well in the panel. She used a variety of painting techniques and her leading, soldering and finishing were all of a high standard. Well done Lorraine! Half way through the evening George McNeillie, head of Creative Industries at City of Glasgow College, made a short speech and handed out the various prizes to the students. It was a very enjoyable evening and we’d like to wish all the students good luck on their journeys ahead in the world of glass. The students exhibiting were Rachel McGloan, K Gow, Lorraine St Arnaud, Sarah Dunlop, Colin Goodall, Kirsteen O’Donnell, Louise Armstrong and Maggie McKie.